If you find a PSN user causing trouble, cheating or offending anyone you can report the user to Sony who can then take appropriate action. Cheating is one of the main reasons we recommend reporting, as these players spoil the fun for everyone. This could involve exploiting glitches in the game to get ahead or use of other non-permitted action. 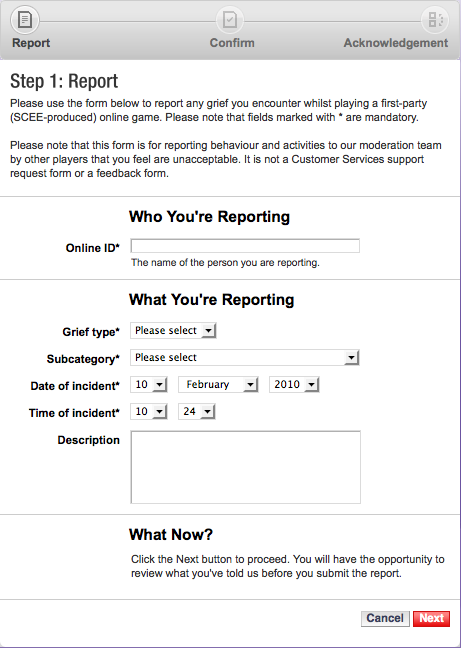 You can use Sony’s Grief Reporting service to report such users. i am yet AGAIN reporting username PATBADBOY23 for his CONSTANT cheating online with dirt2,i know from what i have heard from the rest of my online friends who have also reported him that SONY is doing NOTHING about banning him WHY IS THIS????????????????????????????????????????????????? I, too, am fed up up of having to report PATBADBOY23. Still at it to this very day. I’m sick of it. He, like the guys above, not only cheats but starts messaging people he doesn’t like or race faster than him saying he’s f**ked their mother, threatens people with a virus (he’s just bluffing) and likes to cause arguments between other members of the room on chat. He’s not just a cheat. He’s a parasite. With all the evidence laid out online how much more needs to be done to kick him off?